This is on the shore of Paradise Island in the Bahamas. A late evening thunderstorm was clearing, the sun was setting behind me, and this peaceful calm settled in on the island. The only sounds, were the wind and the ocean waves. Paradise. Our first trip to Antelope Canyon involved a flight into Las Vegas, and then a 5 hour drive to Page, Arizona. The main route between the two cities meanders between Utah and Arizona. Somewhere along this highway, I took this shot. I've never done a long road drive through the desert before. By this point I was sure I passed the same set of rocks hundreds of times. The clouds here were almost painted into the sky, and I knew I had to get the shot. I pulled off onto the side of the road, and in the middle of nowhere (literally), snapped off this gorgeous image, that symbolizes a road trip through the desert. Traveling through Aruba, I was looking for locations that would make for stunning photographs. On our second day on the island, we stumbled across this little section of beach known mostly to locals and devoid of tourists. We knew where the sun would set and the clouds looked just right for a marvelous sunset. We returned several hours later, and I setup to get the shot. Waiting for the sun to be just perfect in relation to the clouds and horizon was a stressful experience. But then, as if by magic, it all came together. The colors took on a magical colorful quality, enough ambient light remained to get a proper exposure of the divi-divi tree, and this marvelous photograph of a tropical sunset was created. And just as fast as it came together, the sun disappeared, darkness fell over the beach, and it was over. It was very special to be out there that evening, and now I'm thrilled that I can share this shot with you. This is my most prized and cherished image. If you sit back, you can almost feel the summer wind of Napa Valley and imagine a glass of Chardonnay in your hand. While driving in the Napa Valley area, we decided to explore a side road leading to a lake. On our way back, we came around a bend and saw this marvelous vineyard with the setting sun in the horizon. I pulled off to the shoulder, jumped out of the car, and took this large panorama, consisting of 11 individual shots which were stitched together to form this panorama. The image is so large, that if printed 90 inches wide, it's still just as crisp and as sharp as you see it here. It's also been featured as the cover image of the 2011 Napa Valley Telephone Directory. This amazing lake high in the Sierra Nevada Mountains of California is named after a shootout that occurred in the 1800s. Today, it's a peaceful quiet place. The glacier that carved out this valley, has long since retreated, leaving behind a refuge for fisherman, hikers, and photographers. I shot this image early in the morning, just before sunrise, the lake was still, and the reflections of the mountains where nothing short of magical. Muir Woods California is an absolutely spiritual place despite being only 15 miles or so from San Francisco. This quiet valley forest provides little indication civilization is so nearby. While walking on one of the many paths, the sun broke through the dense canopy of trees, and painted this one redwood with a luxuriously soft light. I captured it. I often look at this image and can feel the tranquility and peaceful calm that permeates Muir Woods. Lake Tahoe is deep, very deep. It's also really big, 72 miles around to be specific. When I was told of this hidden place called Bonsai Rock, I had my work cut out for me. Some photographers knew where it was, but none would share it's exact location with me. Using photos from other photographers, and images of the surrounding area, I figured it was in the north east part of the lake, but was unable to figure out more. Then I used Google Earth to scour the shoreline of the lake from space, looking for a sign of the large boulder just off shore, with a few small bonsai trees growing on it. After a bunch of work, I found it. My wife and I had to climb down a steep rock face to get to it, but this image is proof that it was worth it. 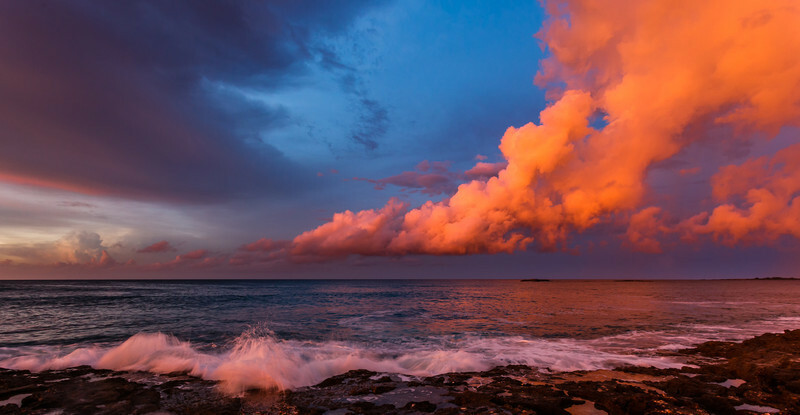 The clouds whipped around in the sky, as the setting sun turned the horizon a bright and warm orange. The final image is as majestic as Lake Tahoe is large. I drove up to San Francisco to photograph fireworks on the Fourth of July. However, our planned position afforded us a fairly poor view of the planned festivities. However the night was far from a total wash out, because as the sun was setting, the fog over the city cleared, and the low lying clouds turned a purplish blue that seemed to cover the city with a magical light. The western coast of Aruba is sheltered from the strong winds and waves that batter the north coast of the island. The western coast is so sheltered in fact, that there are literally no waves at all. An occasional ebb and flow of the water's surface is present from time to time, but the ocean could easily be mistaken for a giant swimming pool. I grabbed my camera and decided to take a few photos as she read a book. Just as the sun touched the horizon, I saw a man walk into the ocean, and I grabbed the following image. He dove just as I released the shutter, and captured this magnificent image of a tropical sunset. This image is one of my largest, and has been successfully printed at 30"x90" by special order. I was driving through the Nevada Desert when I noticed the road ahead of me began to dip, rise, and turn like ribbon. I pulled off to the side of the road and grabbed this shot of the road. I wish I could say I was renting a fast sports car, but I wasn't. Now when I look at this photo, I can only dream about driving it in a small and fast Porsche with the top down. In Aruba, the constant trade winds would launch a traditional beach umbrella far out into the ocean. They never stop, and they can gust with tremendous fury. As a result, these permanent beach umbrellas, called palapas, are firmly anchored deep in the sand. I found the empty stretch of beach to be so serene and peaceful, a constant reminder to relax and take pleasure in simpler things. Gotham, The Big Apple, and Manhattan are words synonymous with one of the world's most amazing and vibrant cities. Bustling with activity, and the hub of fashion, food, and luxury, New York City is a place unlike any other. I just arrived in NYC for a few days, and the weather forecast basically gave me one shot to photograph sunset over the city's skyline. For years I've been wanting to go to the infamous Brooklyn Waterfront, but I never had the chance. That was about to change, as I decided to gamble it all, push luck, and go for the shot. Minutes after getting to Manhattan from the airport, I ran for the subway, tripod and camera in hand. I emerged from the underground station in Brooklyn and noticed gorgeous warm evening light bathing the buildings. Without a moment to lose, I made my way to the waterfront, setup my camera, and started shooting. The result, as you see here, is spectacular. The photograph is like New York City itself, larger than life and grand in every way.